In my previous post on the Magic-Soft V3 update for the Brew-Magic V350, I walked through my perceptions of how the Brew-Magic performed with the software update, and was very pleasantly surprised at the ease of hitting strike temperatures. I have had a few more chances to brew, but been fearful of exploring the Recipe functions, as I did not spring for the Wifi update. Certainly being able to connect a laptop to the network and edit or drive recipes with a keyboard will be much more efficient, and the USB function was disabled with this update, so connecting via USB is out of the question. With a few questions for the Brew Magic team, who was very quick to respond, I managed to use the Recipe functions. There are 4 Recipes pre-loaded, the first three of which cannot be edited or deleted. I have not tried them, so no comment other than – don’t get confused if you cannot edit them – those are protected. The fourth is a simple cleaning step for the mash tun – at 122F. Remember to use the Arrow Keys. I mistakenly believed that only 1 free slot was available to contain personal recipes. Arrow down to reveal more pages. There are many slots available to use. Make sure to properly calibrate the touch screen. Many of the buttons are very small – calibration will help the experience significantly – check your manual for instructions. I have questioned all along, at least in my case and that of many homebrewers, the need for putting a recipe onto the system. Homebrewers brew such a variety of recipes, many with odd or unusual mash schedules, that it seems silly. I could have 20-25 different specific recipes a year, and quickly run out of room. However, I more and more tend to use common mash schedules for certain beer styles, and have setup customized Mash Profiles in BeerSmith to accommodate this. It seems to make sense to me that I should “set and forget” certain mash schedules as recipes on the system as well. This allows for one very key benefit, repeatable timing and temperatures. I am a firm believer that the advanced brewer should be able to replicate any brew, and such is a direct measure of skill, note taking and attention to detail. Being able to more directly program my intended mash regiment could be extremely helpful. 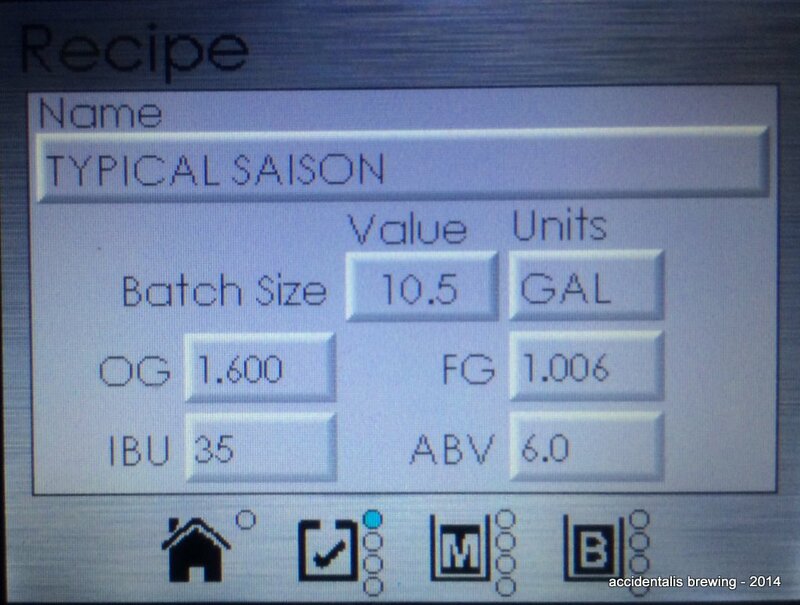 Below is a basic attempt (if overly complicated purposefully) to add a Saison Mash recipe onto the system. I brewed with this schedule this weekend – the results are in the fermenter chugging away. 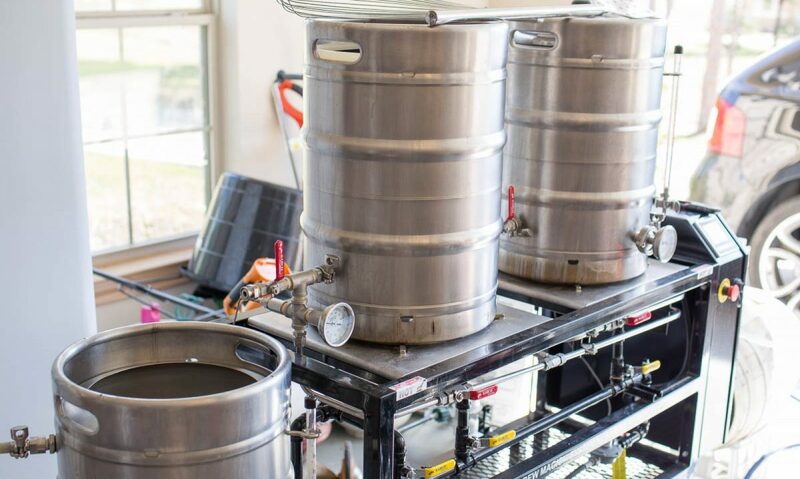 Step 1: Exit any Brewing Session that is active. This was my first mistake. I tried to create a recipe on the fly and it didn’t go well. Being in a Brewing Session limits the edit-ability of your recipe. Once you have entered the Recipe Book, you can select a blank slot or select an existing recipe to edit. Note, recipes #1-#3 are not editable nor erasable. If you need a new page, use the down arrow key. For the sake of illustration, I already created a recipe called ‘Typical Saison’ referring more to my mash schedule than actual recipe. Click recipe name, and then touch the green highlighted ‘Load Recipe’ button. 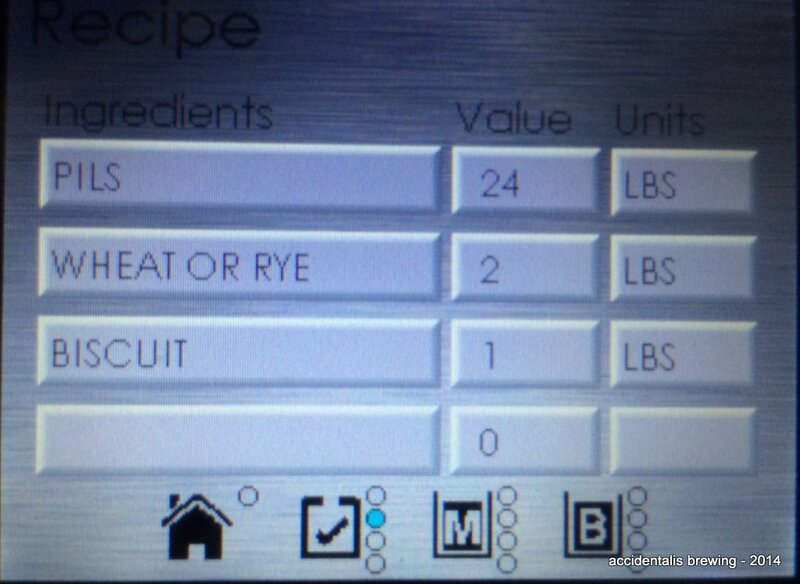 On the first Recipe screen (see the check icon with 4 dots next to the home icon), you will enter the basic parameters. Touching any of the raised fields will launch a mini-keyboard. Here I filled in general statistics, not necessary the ‘real’ parameters. Using the Arrow Keys takes you to the additions pages, where you will add both grains, hops and other adjuncts as required. Note that Units must be entered, there is no global variable setting. This is convenient as I use Lbs and Oz for grain, and grams for hops. It would be important to add all of the ingredients if you were using this as a recipe manager, even the yeast selection. There are two additional pages – enough room for a complex list of ingredients. By clicking the Arrow Right key, we move to the next icon, Mash. Here you can enter up to 4 mash steps, specify the Temp and the time. Note that degrees temperature are set at the main screen as either Fahrenheit or Celsius as a global variable. 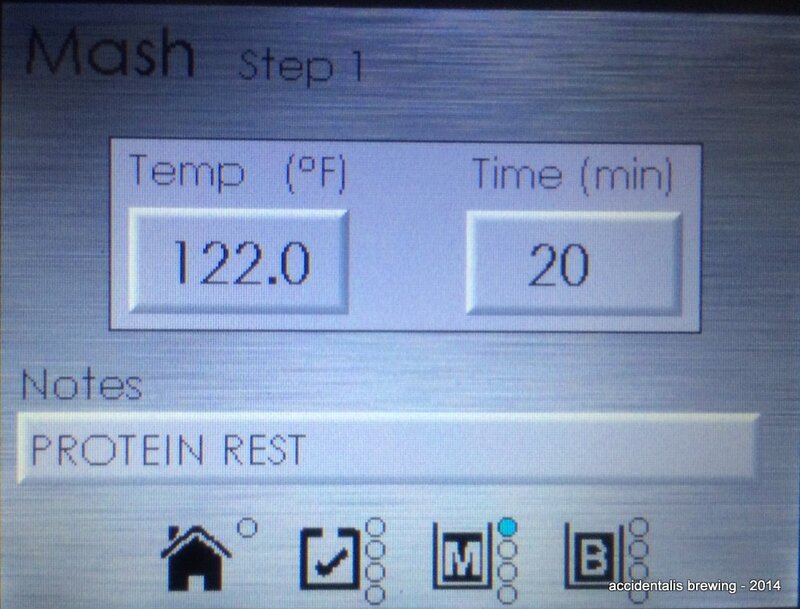 And I added in both a rest at 148F, 156F and a mash out at 170F. I used the Notes field to describe the specific of the rest. As I mentioned, I see this as the most useful component. 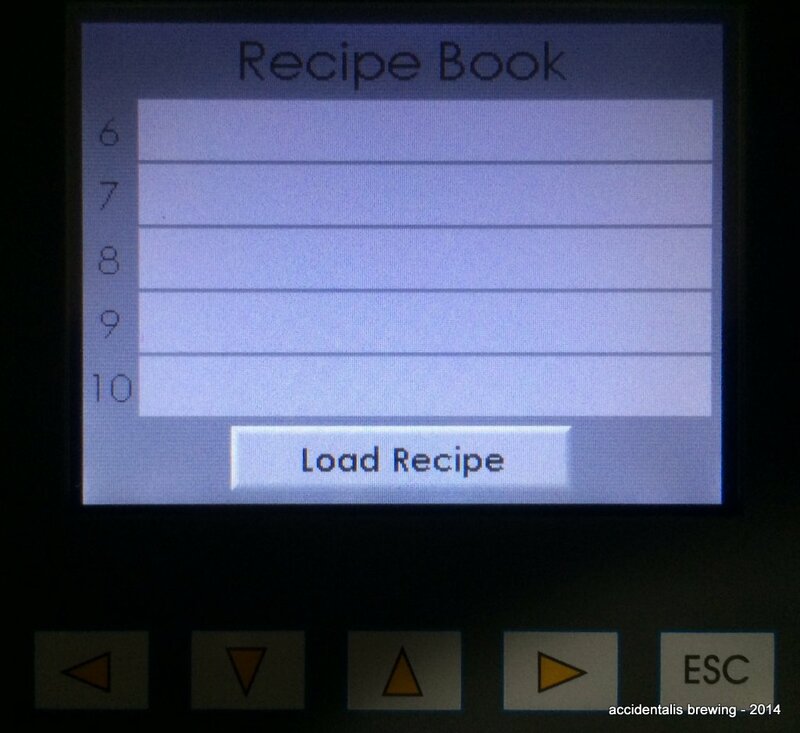 When you load the recipe and start it – you follow the timers and instructions as directed on the system, eliminating some of the larger variables. I often lose time on my counters if I step away or am distracted for a bit. This way – the system will alert me to a change step. Finally, we use the Arrow Right key – and reach the Boil page. 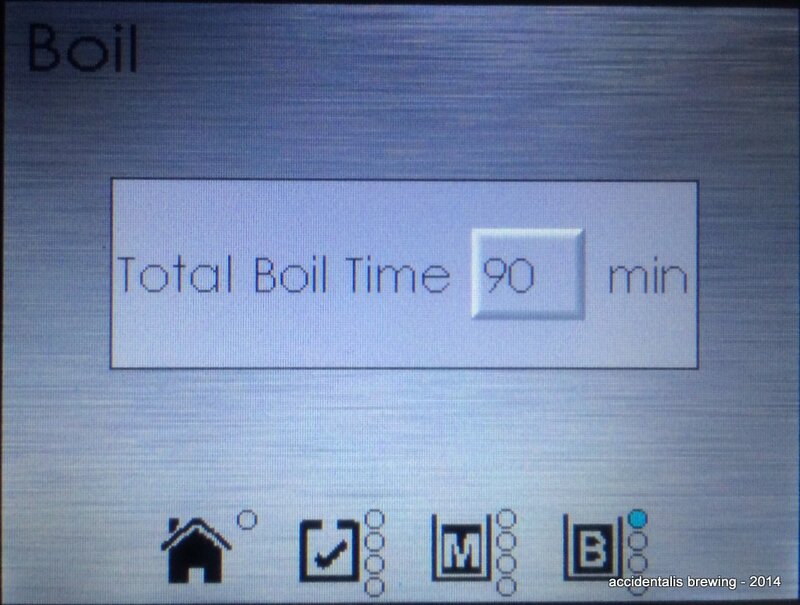 Here, you set the desired boil time, 90 minutes in this case as I am using Pilsner malt. Using the Arrow Down key, we access the Boil Additions. So all of the key points of additions of hops, finings or spices can be added in. When you are done, use the Arrow keys to navigate back to the Home icon. 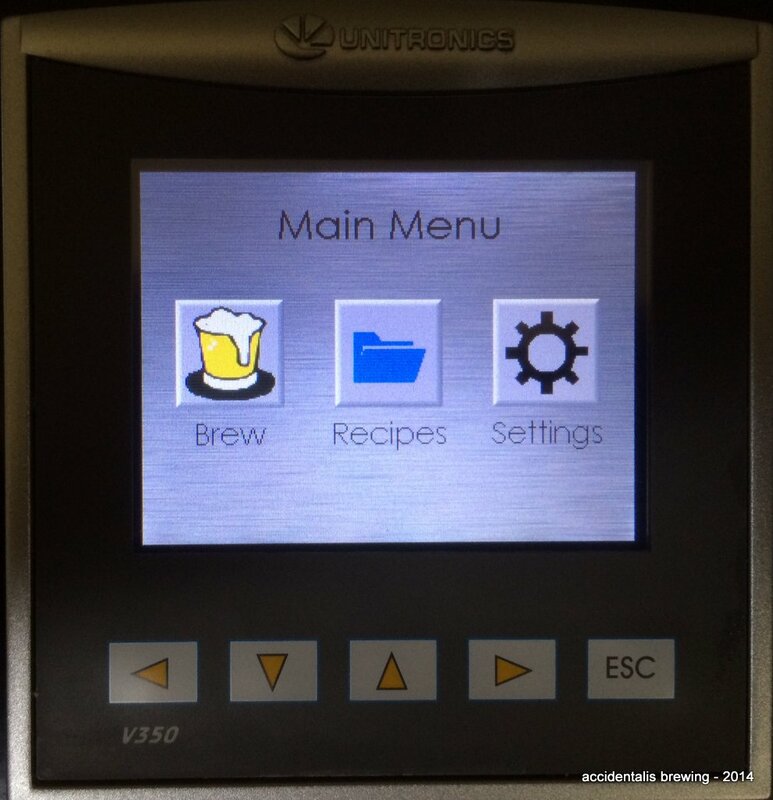 Here you have options, Brew starts the system into brewing the recipe. The Door icon exits the recipe and doesn’t save it. The Save icon, obviously saves the recipe into the right slot and finally the Trashcan deletes the entire recipe and frees up the slot. Conclusion: While I have yet to brew with the Recipe function, I intend to take advantage of the feature moving forward. I see a lot of convenience removing some of the ambiguity and inconsistency in my process. I have been brewing a lot of saisons – experimenting with ingredients. This should result in a more detailed comparison, and eliminate possible errors in reproducing a mash schedule. Programming the system is a bit time consuming, and the touch screen is not the best interface for people with big fingers, but is workable. I plan to sit and unify my custom mash schedules between the Brew Magic and Beer Smith, which should only take an hour or so of work. I have to wait to make a determination if my assumption is correct. 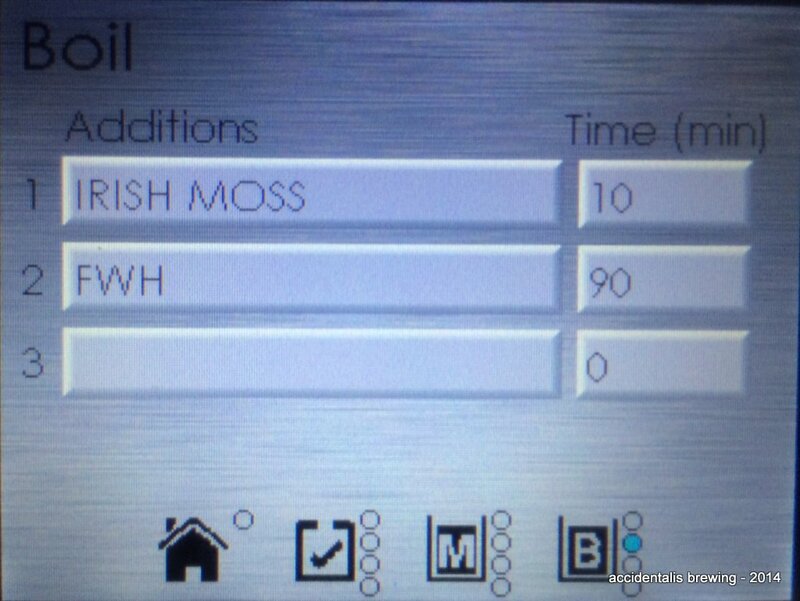 But I do see the value of unifying my mashing steps and processes on the Brew Magic. I makes the repeatability factor much more important to me now. Turn on the chime. It is in the system settings and was turned off for some reason after I did the upgrade. If you use this the way I do – add in all of the possible addition points during the boil (60, 30, 15, 10, 5) – the little reminders continue to call your attention back to the system and you just tap the screen to remove the reminder. If you don’t use those additions in a brew – ignore it or just pass through the alert. Be prepared to monitor the fire. While the new heating curve works much better (IMO), over heating the mash can cause a lot of shuffling on and off of the kettle. I am trying to figure this out – and it only happened once. Also – for those that keep asking me to send them my upgrade: this is both unethical and impossible. The UID for your computer is matched to the firmware, requiring a special code to unlock. Otherwise it becomes useless. I believe it is worth every penny. Thank you for the write up. Yesterday I brewed my first batch with the Brew Magic. Being the 1st batch I decided to do everything manually but in hindsight I wish I hadn’t. My neighbor came by while I was brewing and it would have been nice to me have the reminders. 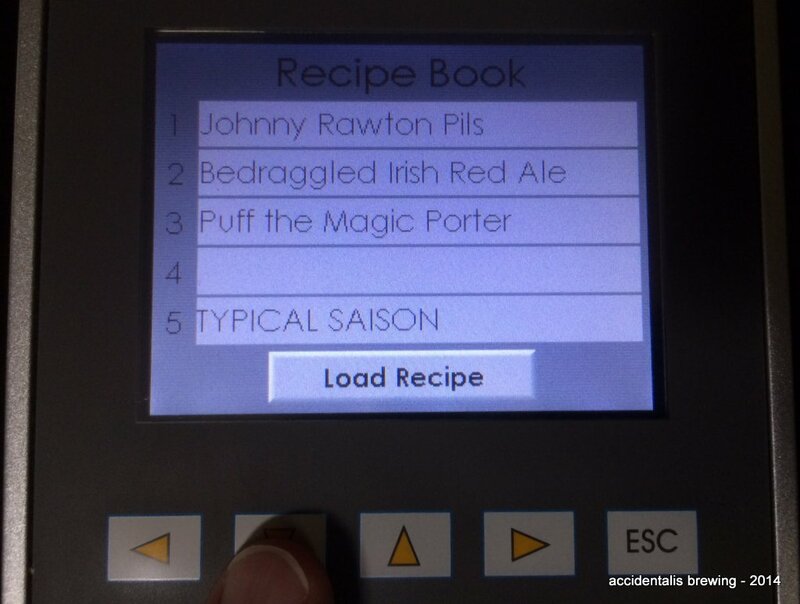 Now that you have used the recipe function do you think you’ll enter your Beersmith mash schedules as a recipe? I have brewed just over 20 batches now using recipe function. I have a few of my BeerSmith mash schedules entered and using the normal prompts it works very well. Lately, just because I have been exploring more step mashes, I have been editing one (a lager profile) for more specific steps and times as well as customizing the boil additions to represent the actual recipe (rather than the usual FHW, 60, 30, 15, 10, 5 and Flameout@1) additions. Works very well and only takes a few minutes to setup. I would encourage you to save right after the changes and then review all of the up/down arrow areas of the interface… I have accidentally left prompts that should have been removed. Cheers!